Pretty white, bone china cup sets with a bright summer motif. Roy Kirkham used bright red strawberries and buzzing bees to decorate these cup and saucer sets. Set of two cups and saucers. Several processes are involved in the making of bone china, but the ingredient that sets it apart from porcelain is that bone ash is added during the manufacturing of the piece. This makes the piece lighter and more translucent than porcelain. 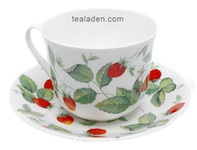 The processing of bone china is more elaborate and more expensive than other types of china, so the price is reflective of this more extensive process. This process also gives bone china mugs and teacups their thin rims and makes sipping a cup of tea more enjoyable. It is easy to tell if your piece is bone china or porcelain. Simple hold it up to the light and it will have a white, translucent look if it is bone china. Bone china undergoes two firing processes. The first makes the product shrink causing about 20% of the pieces to break. The second firing happens after the piece is glazed to melt the glaze onto the piece. Those that do not crack or break during this stage are decorated with their final patterns. The decoration can be hand painted, sprayed or decals are applied. Many pieces have gold, silvered, or colored paint applied to the rim.